Hong Kong activist Joshua Wong was jailed for the second time Wednesday for his role in mass pro-democracy protests as concern grows that prison terms for young campaigners are shutting down debate in the semi-autonomous city as Beijing increases control. 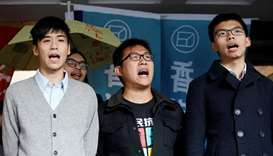 An appeals court jailed three leaders of Hong Kong's democracy movement for six to eight months on Thursday, dealing a blow to the Chinese-ruled city's youth-led push for universal suffrage. Police cracked down on Hong Kong democracy activists Monday saying they would be charged over the Umbrella Movement mass protests, a day after a pro-Beijing candidate was chosen as the city's new leader. A young woman who grew up in Mumbai’s red-light district facing poverty and sexual abuse. Reach Out To Asia (Rota) hosted a special community Iftar event for the Qatar Foundation for Elderly Care.